I didn't really intend to stay up late last night putting together the computer, but I did kind of get obsessed with the project. Since my previous post, I had to remove the power supply a 2nd time in order to connect some secondary cables, which were impossible to get in with the supply in it's mount (the Enermax PSU I got has modular connectors). Installing the motherboard and CPU was considerably easier than the power supply. The pinless design of the LGA775 socket is a nice improvement. I did a double-take when I put the chip in the socket and it went snugly into place with no effort. Removing the gigantic CPU heatsink I got is going to be a real issue if the need ever arises. Last night I was thinking it was going to be nearly impossible, because there is almost no room for me to get my fingers around two of the posts to do the quick release. But after getting (some) sleep, I realized if I remove the motherboard from the case, it will be not quite as impossible... a PIA but doable. Next came the hard drives, DVD drive, video and sound cards, cable connections and LCD poster. I had to plug it in to see if it would boot up, and guess what... it booted the first time (woohoo!) It's actually a lot quieter than my old PC, but the real test for noise will come with a demanding game. Way too late to install the OS but I did pop in the OpenSUSE and Vista disks for fun; they started up no problem. I probably will do the OS install tonight, though since I have class I won't have time to do much with it. I've installed the power supply, made by Enermax. 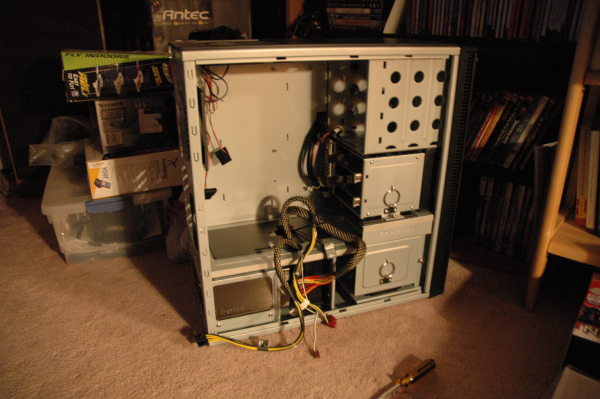 The PSU has a large fan on the bottom, and the cage for the PSU is in the bottom of the case. Initally I installed it right side up, but realized that airflow to the fan was very restricted (a 1/2" high chamber open only on one side), so I yanked it out and flipped it over. I love this case. It actually came with a manual (another first for me)... has pull-out drawers for the hard drives - see the two rings in the lower right.